Conjunctivitis means inflammation of the transparent membrane that lines the surface of the white of the eye and inside of the eyelid. It may be caused by infection, allergy, chemicals (including eyedrops) as well as other, rare causes. Conjunctivitis usually affects both eyes, although one eye is often more severely affected. Conjunctivitis is often a relatively minor illness, and usually gets better by itself. It can be more severe and may become chronic; in both situations a specialist opinion may be necessary. The most common infective conjunctivitis in adults is viral, usually caused by one of the many serotypes of adenoviruses. The condition is highly contagious, carried in the tears, affecting one eye and then within 24-48 hours usually the other eye, a week to ten days after contact with an infected person. There may be an associated cold-like illness. The eyes are red, with copious watery discharge, soreness and photophobia. Adenoviral conjunctivitis usually resolves without complications, but in around 5% of patients a secondary corneal inflammation occurs as the original infection resolves, requiring specialist medical treatment, usually with steroid eyedrops. Bacterial infection in adults is uncommon. The eyes are red with a purulent discharge. Treatment with antibiotic drops is usually necessary. Chlamydia is a sexually transmitted disease spread by direct contact to the conjunctiva, and commonly causing a chronic, conjunctivitis with a mucopurulent discharge, affecting one or both eyes. Treatment is with both eyedrops and tablets, and the affected person and their partner(s) needs to be seen in a sexually transmitted disease clinic. More significant redness, with mucopurulent or frankly purulent discharge is likely to be bacterial; most cases will resolve spontaneously if left untreated. 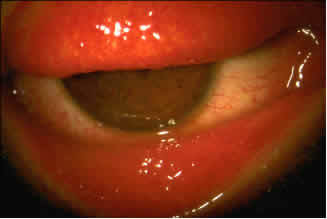 A clinically severe case or one that fails to show improvement after a week may require treatment with a broad spectrum antibiotic such as chloramphenicol or fusidic acid. Chronic watery and sticky eyes in young children may be due to congenital nasolacrimal duct obstruction. This usually clears spontaneously in the first year of life; if not, probing under general anaesthetic may be required. Topical antibiotics are not needed except for episodes of secondary infection, marked by redness of the eye(s) and increased discharge. Allergic conjunctivitis is an extremely common condition with a wide spectrum of severity. Itching with watery discharge are the main symptoms. The condition ranges from acute hayfever conjunctivitis to a chronic condition that may be severe and sight-threatening. The more severe cases are usually seen where there is co-existing allergic eczema and asthma, a condition of overactive immunity called atopy. Most cases can be managed by avoiding known allergic triggers and the use of tablet and eyedrop antihistamines. Chronic cases may require preventative eyedrops (e.g. cromoglycate) and more severe cases may require specialist care, with steroid or immunosuppressive eyedrops. Any eyedrop may cause an allergic reaction, either from the active agent or the preservative (usually benzylkalonium chloride). Surprisingly, the reaction may not be seen until the drops have been used for several months, for example in glaucoma treatment. There is a periocular dermatitis, with conjunctival redness most marked in the lower part of the eye. Stopping the offending drop usually cures the problem.